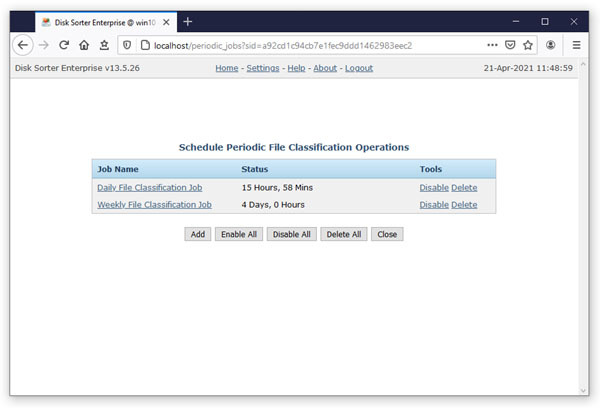 DiskSorter Server allows one to setup a number of periodic file classification jobs with each one configured to perform one or more file classification commands at specific time intervals. In order to add a periodic file classification job, press the 'Periodic Jobs' button located on the DiskSorter Server home page and press the 'Add' button. 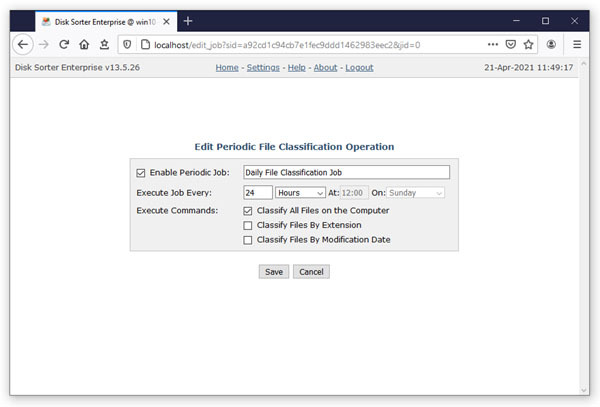 On the periodic job page, enter a unique periodic job name, specify the time interval and select one or more file classification commands to execute. In order to reduce the CPU load and memory usage on the host, DiskSorter Server performs selected file classification operations sequentially, one after one while saving reports and executing conditional file classification actions if required. In addition, the user is provided with the ability to intentionally slow down file classification operations, in order to completely eliminate performance impact on production servers. To slow down a file classification command, open the command page, press the 'Options' button, select the 'Low Speed' performance mode and press the 'Save' button.